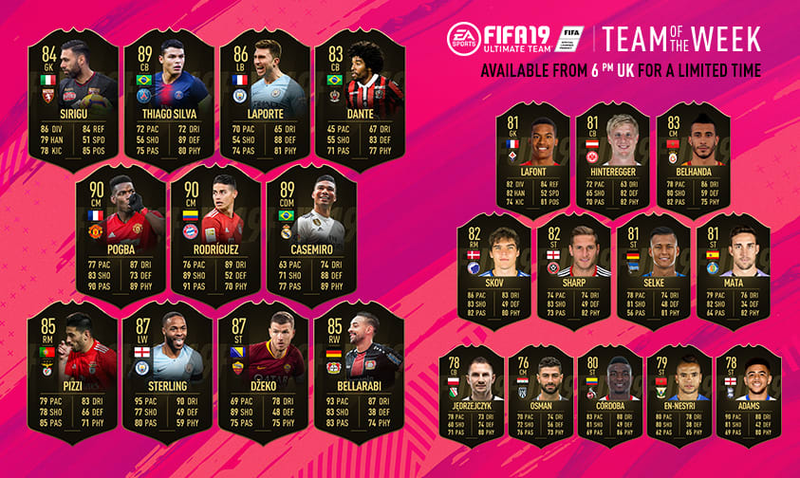 Wednesday the 23rd TVDW was released on fut 19. And there are again very good players in between. A number; 90 rateds 89 and more walkouts! The best player of this TVDW is also immediately the most expensive and that has become the star player of Manchester United: Paul Pogba. He has received a 90 rated TVDW card. This also directly affects his Fut Headliner card that is being upgraded to a 91 rated because that card is ahead of an inform. The other 90 rated player is James Rodriguez from Bayern Munich, after the victory at home against Schalke in which James Rodriguez also had a share. This is already his 2 inform and his 4 special card of this fifa. The other 3 high rateds are all 89 rated. These are 2 Brazilians: Casemiro, after his spectacular blow against Atletico Madrid, so Real won the derby. The 2nd Brazilian is Thiago Silva the central defender of PSG. As he played a strong pot against Bordeaux, PSG managed to keep the 0 and only 1 goal was enough for the 3 points. The 3rd inform of this rating is Sterling. Sterling actually had an 87 rated inform but there have been winter upgrades done by fifa which has made his inform 89 rated. He owes this TVDW to City's big win over Chelsea. The other City player with an inform is Laporte, he normally plays in the heart of the defense, but in the match against Chelsea he played left back and that is why he also received an inform left back. The other and last really high rated is Edin Dzeko. The top scorer from roma received an information after his performance last weekend. There were also 2 85 rated walkouts in the form of Pizzi and bellarabi, both playing in the front right position, one at Benfica who managed to win 9-0 and the other at Leverkusen. The only other walkout is Sirigu the Italian goalkeeper kept a good game for Torino and so he got an 84 rated inform. Unfortunately there was no Dutchman in the TVDW. But a Dutch-related inform namely Mohammed Osman of Heracles Almelo he managed to score the only goal in the 1-0 victory over ajax. So he was the match winner.